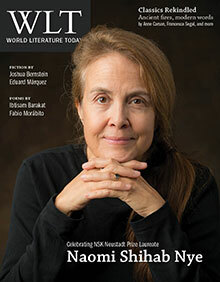 Against this “fake” global lit and its “toothless ecumenicalism,” the n+1 editors call for an oppositional project marked by a “thorny internationalism” that would take its inspiration from the formal innovations of the avant-gardes of international modernism and from what they call the “truth” content of international socialism. 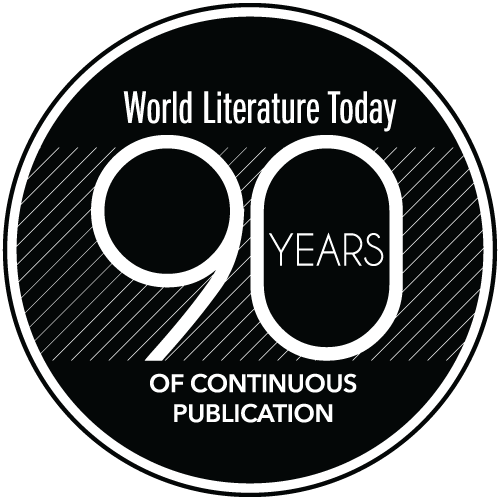 Many of the writers they champion in this regard—including Marie NDiaye, Juan Villoro, Álvaro Enrigue, and Tabish Khair—have been featured in the pages of WLT . . . as have many of the literary elite guilty of perpetrating “world lite,” in their opinion. Looking back merely a century, however, leads to a foreshortened, indeed distorted, view of world literature. 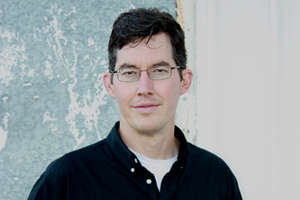 The writers featured in this issue’s special section, “Classics Rekindled” (page 36), take a long view that reaches back, not to the twentieth century, but to the sixth century b.c.e. and beyond. For Anne Carson and Don Schofield, their point of reference is ancient Greece; in Schofield’s poem, “In Lands Imagination Favors,” he reminds us that the benevolent tyrant Pesistratus “invented tragedy by pitting / the chorus against itself.” And thanks to Pesistratus, who commissioned the copying and permanent archiving of Homer’s epic poetry, The Iliad and The Odyssey are known to us today, ensconced as the West’s foundational epics. Jean-Paul Michel’s contributions invoke a range of references that include Japan’s Heian period, Seneca and Dante, Mallarmé and Rimbaud, Dickinson and Hopkins. In writing’s ability to “give a face to presence, to loss,” Michel writes, the “most burning part” of poetry “transmutes time into full presence.” And in Francesca Segal’s essay “Innocents Aloud,” she reflects on the pleasures of listening to audiobook versions of Midnight’s Children on a trip to India, Anna Karenina on a train through Connecticut, and A Tale of Two Cities while on the Boston Common. By contrast, in an elegiac mode, Czech poet Sylva Fischerová imagines a crowd of mourners in front of a crematory contemplating “how poets die,” with the “unspeakable . . . cast into / the cement of grammar,” while Lucia Perillo wonders how, in rituals of war, “the body tells a story / mostly about loss,” comparing American football to a ball game played by the “death-lords” of Mayan mythology. “World lite”? Hardly. In Economy of the Unlost: Reading Simonides of Keos with Paul Celan, Anne Carson writes: “Do poets still watch the flame burn down? But to praise it is a gratuitous act, like throwing coins onto a pyre.” Contemporary authors who write in classical modes or invoke ancient mythologies are not just sifting through lifeless ashes or pandering to a global elite. For Goethe and his fellow German Romantics like Herder and the Schlegel brothers, the “world” in Weltliteratur was truly global in scope but deeply rooted in the Indo-European classics, especially those of ancient Greece. History may be a pyre, but the ideal of world literature remains a flame. And for writers who array themselves “on the side of the angels,” they take the view of Walter Benjamin’s angel of history, looking backward as they write into the future.